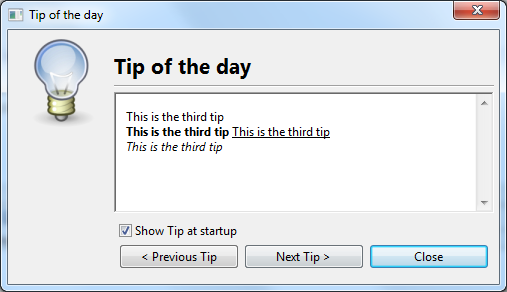 This component is a widget that displays a "Tip of The Day". It contains the area to display the tip, buttons to navigate through the list of tips, a close button and optionnaly a checkbox "show tips on startup". 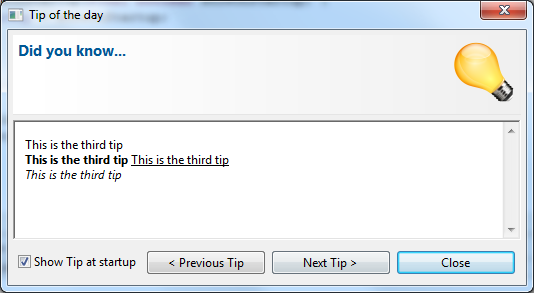 tip.addTip("This is the first tip<br/> " + "<b>This is the first tip</b> " + "<u>This is the first tip</u> " + "<i>This is the first tip</i> " + "This is the first tip " + "This is the first tip<br/>" + "This is the first tip "
tip.addTip("This is the second tip<br/> " + "<b>This is the second tip</b> " + "<u>This is the second tip</u> <br/>" + "<i>This is the second tip</i> " + "This is the second tip " + "This is the second tip <br/>" + "This is the second tip "
You can get the status of the checkbox "show tip on startup" by calling the method showOnStartup(). This page was last modified 06:41, 21 February 2018 by Laurent CARON.